Renovations are nearly complete and the furniture is arriving! This is the rental that can appease everyone in your crowd. 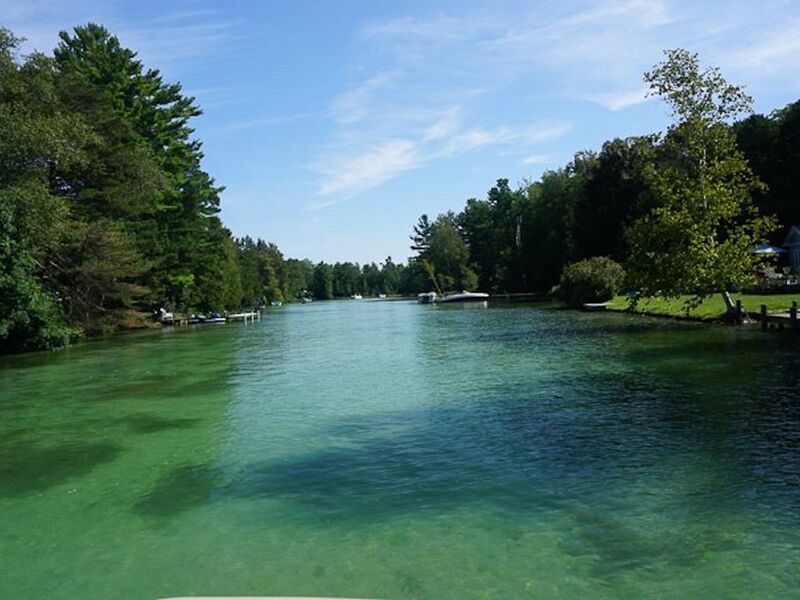 Waterfront with a dock for your boat - providing access to Lake Leelanau, just a 2 minute bike ride from downtown Leland, a quick walk across the street and you are on the Lake Michigan beach! This large 4 bedroom home is currently under a complete renovation and boasts a brand new kitchen and living area with fresh updates in every room. There is a large deck on the riverfront side of the house for outdoor dining and a large yard for the kids to play in. Bring your boat or rent one from the local marina. Spend your days on the crystal, clear waters of Lake Leelanau or beach combing along Lake Michigan - this house offers you the best of both lakes. Out door fire-pit perfect for roasting smores! There should be basics such as oils, vinegars, coffee filters, commonly used spices, flour, etc. Brand new, fully equipped to be your home away from home. Too many bonuses to mention, but we should mention that there is an approved high chair. Beautiful home right on the clean, clear river, walking distance to town and the lake. Has everything you need and I mean everything. Kitchen very well stocked with a variety of appliances, dishes and glasses. Very neat, clean and organized, abundance of space. My friends and I stayed here for a girls wine weekend and would stay here again in a heart beat. Robin is very responsive to emails and did a great job showing us through the home. Would highly recommend! This was a really stunning home that lived up to all its promises! The home was by far the best stocked home we have ever rented for our annual trip. The owners really thought of everything. It was in pristine condition, and decorated in a lovely manner. There are great gathering spaces, and lots of room for privacy as well. Our only regret is that the weather was quite chilly while we were there, so we didn't take advantage of the fabulous outdoor space. Thank you so much for your kind review!!! We are so glad that you enjoyed the space as much as we do! The property was beautiful and the home is stunning. We loved being there for a long weekend - unwinding in a fabulous environment. They had everything we needed plus some things we needed for our little ones - high chair, pack n' play, crib, toys, games, life jackets, water toys... The spaces made it easy for our large group to gather but still allowed for breathing room between the multiple families (to deal with screaming children in privacy :). We absolutely loved our experience. Robin was super helpful and made the whole process easy and enjoyable. A lovely house with an amazing backyard to the water's edge. We were two families with our five kids who came to stay for the week. The lovely and large house was a great fit-- all the kids stayed upstairs in the "kids loft" while the two parents stayed in spacious master bedrooms. There was an extra fourth bedroom we didn't even use! The newly remodeled kitchen was wonderful with a great setup and fully stocked with all the dishes, tools, pots and pans we needed for cooking (except when we used the large grill outside!). The living rooms were well furnished and comfortable-- nice but still easy for lounging. The back deck, yard and dock are the superstars of this place. The house has a couple of kayaks which we used as folks lounged on the dock. The inlet (which leads out to town or Lake Leelanau) was perfect for our younger kids-- <3 feet deep, a great place to play and splash and take out the kayaks safely. We also rented a boat one day and were able to pull it right up to the house. Most nights we ate dinner on the table for 10 on the back porch then lit a fire by the water and watched the stars. The location is also excellent-- a short (5 minute) walk to several beach options on Lake Michigan or to the town of Leland. We enjoyed the ice cream shop (a few times), the local bookstores, restaurants, clothing stores and overall small "Fishtown" feel. The house was just perfect- highly recommended for a great visit to the UP. The perfect home and setting for a family, to enjoy. This home definitely met, and exceeded, the description given on VRBO. I have rented many homes over the years, and this one was, by far, the best. The setting, the home, and the area, is a perfect place to vacation. Thank you Robin, our host, for all of your information and help before, and during the vacation. Thanks to the owners, for the excellent job on the home. Thank you Jim and Diane for taking the time to review River's Edge. Since it is a new property your reviews are very important and helpful for future travelers. We are so glad that you enjoyed the house! You were wonderful guests to host and we hope to see you again some time in the future! We take an annual trip with a group of friends to take a week and get away from kids. Usually it is a little difficult to find a great spot for 8 adults, but this fit everyone great! The lake is great for boating and has plenty of room to get most any boat around. The channel you're on is perfect to relax in and treat as a lazy river so you're taken care of water wise. You're close to wineries, dining, or just enjoy the fireplace in the backyard. Truly an amazing location. Don't hesitate to ask Robin anything she's wonderful and can guve yiu advice on anything in the town. If you're thinking about a vacation in this area, this place should be on the top of your list.